Vienna, Austria: Habsburg emperors, Strauss waltzes, coffee, and Sachertort. And, for the coming weekend, the home of the inaugural KHL World Games. Fittingly, in a city where history oozes from every pore, Vienna is set to welcome the oldest club in the KHL, Slovan Bratislava, as well as two giants of the game – the most successful hockey club in history, CSKA Moscow and contemporary powerhouse SKA St. Petersburg. The Slovaks, near neighbors, are coming to the Austrian capital for two home games. On Friday, CSKA will be the guest at the Erste Bank Arena; two days later SKA will provide the opposition. In a city with a proud hockey history – but a shortage of top-level action since the 2005 IIHF World Championship – it’s a big event. For the KHL, these games represent a great opportunity: it’s a chance to bring the skills and spectacle of our league to a new, international audience. For Vienna, it’s a fantastic glimpse of some of Europe’s top teams and a chance to sample the special atmosphere of game day in the KHL. For the clubs involved, apart from the on-going battle for points in the Western Conference, it’s a refreshing change of environment and an occasion that helps break new ground in the promotion of the KHL – taking some of the best that our league can offer, introducing it to a wider audience and sharing the thrills of hockey at the highest level. There’s no shortage of big-ticket talent on display. CSKA’s roster for Friday’s game is set to include a clutch of stars who won the Olympic title in Pyeongchang back in February. Kirill Kaprizov, whose overtime winner in the final was the most golden of goals, leads the way; fellow forwards Mikhail Grigorenko, Sergei Kalinin, Ivan Telegin and Sergei Andronov were also involved, along with defensemen Nikita Nesterov and Alexei Marchenko, plus goalie Ilya Sorokin. SKA’s selection is no less stellar. Triple Gold Club member Pavel Datsyuk leads the way, just one of a host of Olympic champions including free-scoring forward Nikita Gusev. Then there’s the KHL’s current scoring leader, Patrik Hersley, the ultimate two-way defenseman. Summer signing Nail Yakupov, once a #1 NHL draft pick, offers a flavor of the unpredictable wherever he goes. Between the pipes, there’s a choice between World Champion Magnus Hellberg or Olympic medalist Igor Shestyorkin. With so much talent available, it’s little wonder that these two are battling it out at the top of the Western Conference. Slovan, meanwhile, is the KHL’s oldest team. Founded in 1921 – 25 years before the inaugural USSR ice hockey championship – the Bratislava club has long been a powerhouse of Czechoslovak and Slovak hockey. Since joining the league in 2012, Slovan has twice reached the KHL playoffs. This season, under head coach Vladimir Orszagh, the roster draws heavily on young Slovak talent and is maturing fast in the big league. A recent five-game winning streak lifted the team to the brink of the playoff places, while several local prospects are honing their skills before the 2019 IIHF World Championship comes to Slovakia next May. And Slovan could certainly use the points. Currently ninth in the Western Conference, just outside the playoff places, a strong showing over the weekend could lift the Slovak team above Dinamo Riga or Vityaz and back into the top eight. Vladimir Orszagh’s men have steadily improved this season and have proved that they can raise their game when up against the best. Austria isn’t the only country getting a visit from the KHL this weekend. On Friday, Jokerit Helsinki takes a short ferry ride to Tallinn, Estonia, where it will play its games against Spartak and Severstal. 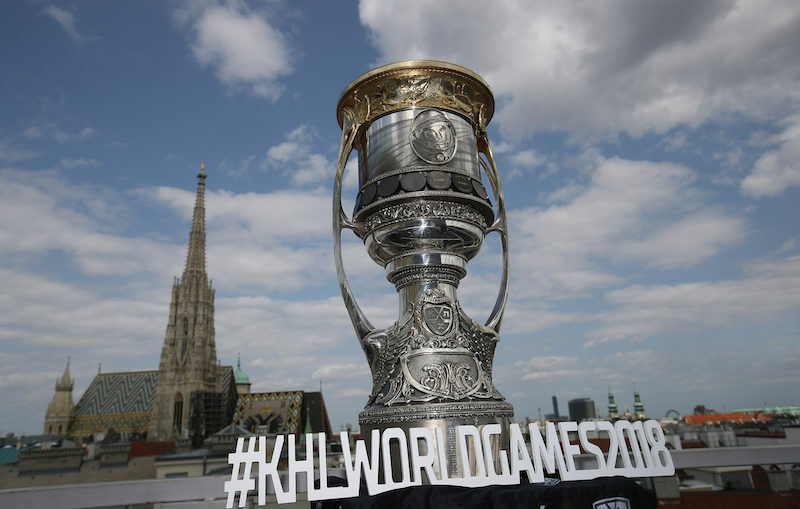 The KHL World Games continue in November when Dinamo Riga hosts SKA and CSKA in Zurich, Switzerland.